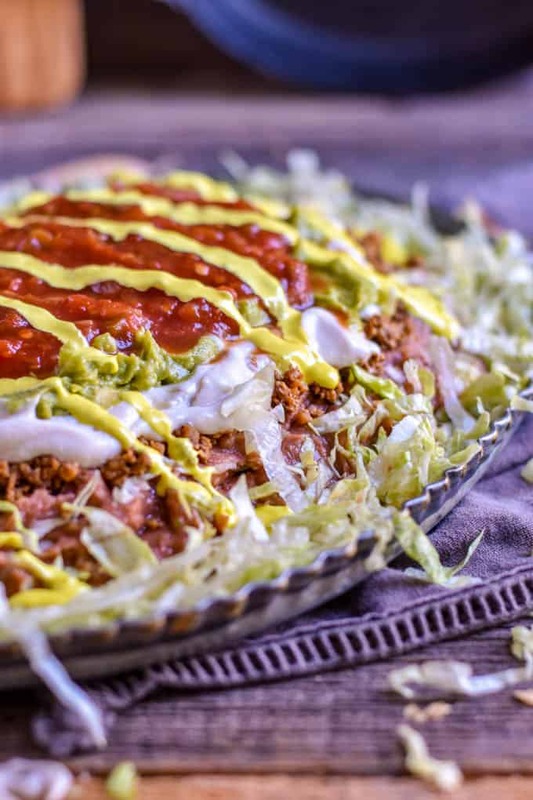 Mexican Seven Layer Bean Dip! Made with my Unfried Refried Beans, Cauliflower Mushroom Walnut Taco Meat, Easy Vegan Tofu Sour Cream & Game Day Cheese Dip! It’s healthy, whole and totally vegan. 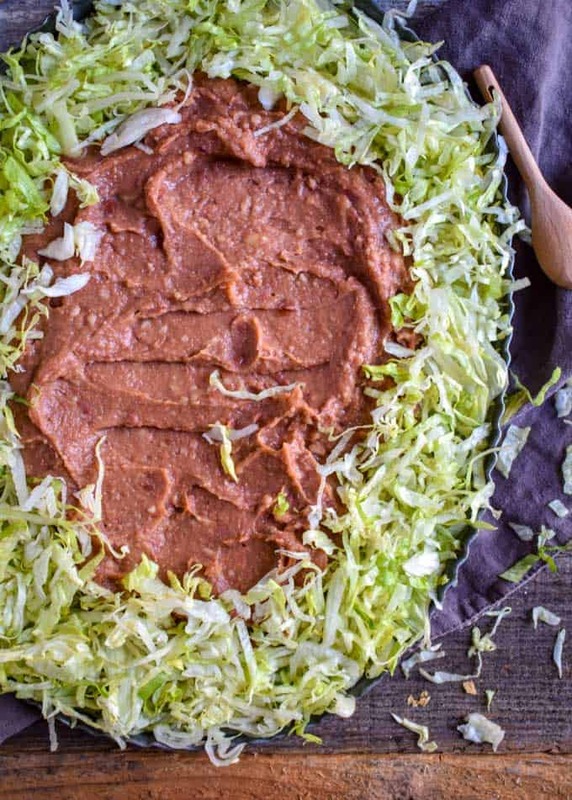 Getting tired of all those other boring bush league bean dips everyone brings to a party? Yeah, me too. They’re unhealthy. Made with a ton of pop-top processed crap. And, probably even outlawed in some states. At least they should be. But, let us not curse the darkness. Light a candle of hope. 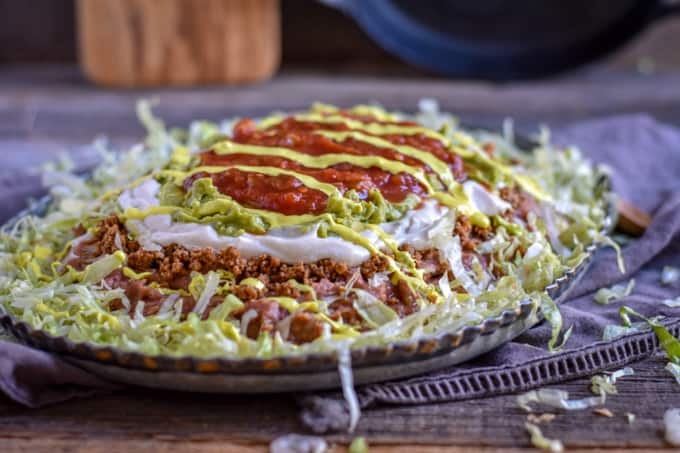 Roll out this badass Mexican Seven Layer Bean Dip at any party and you will forever be king of the snack bar. World saved. Mission accomplished. Let’s make it! DISCLAIMER: I know everyone hates frivolous musings and tons of pictures on food blogs. You just want the recipe. I get it. But, I do have lots of pictures so you can see the process. If you’d like to “wing it”, you can hit the “Jump To Recipe” button under the title. But, if a picture of your recipe ends up on a Buzzfeed food “Nailed It”, you can’t say I didn’t try to help. OK, carry on. 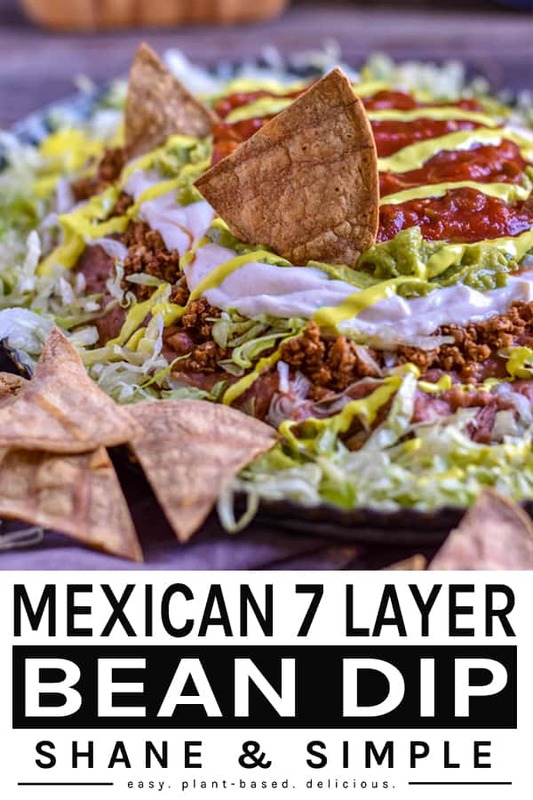 Grab your favorite platter or baking dish and let’s make Mexican Seven Layer Bean Dip. I went with the platter so you could see the layers…and it looks so damn pretty! So, I’ll be laying out the process for the serving platter. But, if you are using a baking dish. No worries. It’s not complicated. Just pile everything up in the dish and serve. Really. That’s all there is to it. Spread the beans evenly and leave some space around the edges. Fill in the space around the beans with shredded lettuce. You can shred or chop it yourself. But, I’m lazy and like the convenience of the prepackaged stuff. 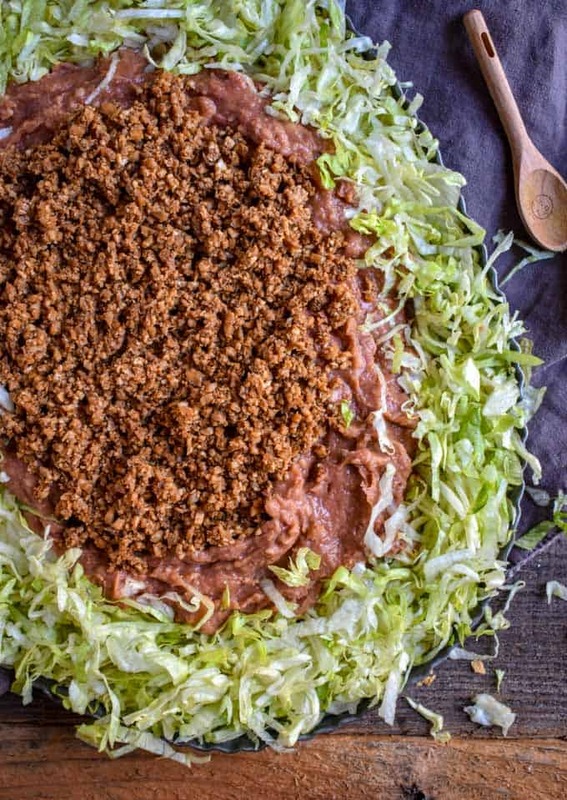 Spoon the desired amount of Cauliflower Mushroom Walnut Taco Meat onto the beans and evenly spread. Ooh, baby! It’s starting to look like Mexican Seven Layer Dip. Yum, yum, yum! 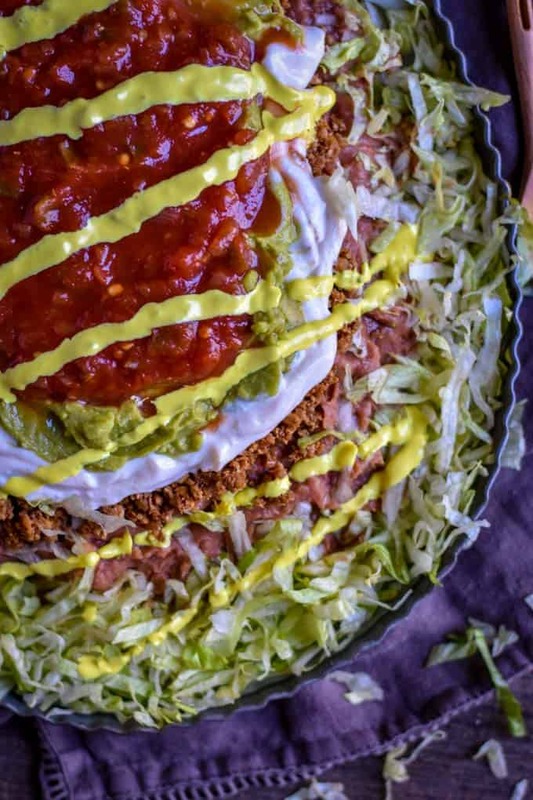 Now, add the Easy Vegan Tofu Sour Cream on top of the taco meat. We’re getting close! 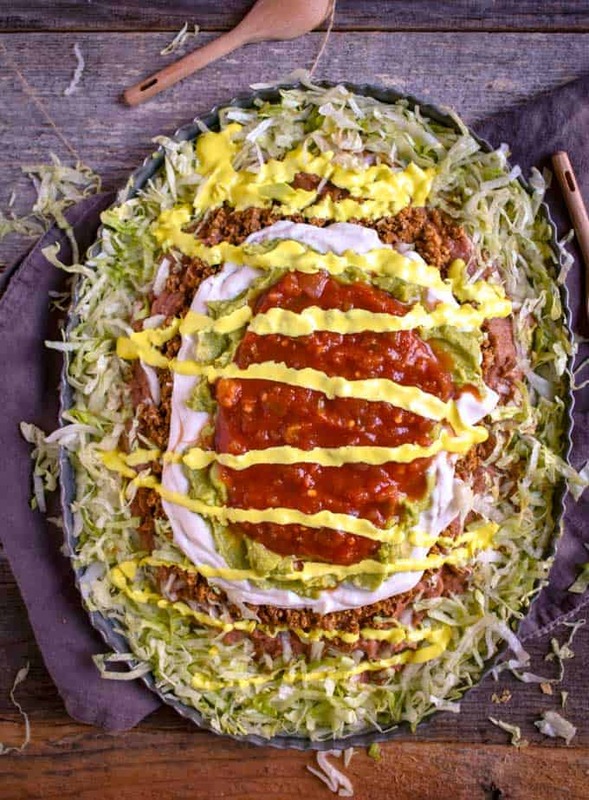 Spread your favorite guacamole evenly over the taco meat. Yes, I use store bought guacamole because I get tired of waiting on the avocados to ripen. No, I’m not apologizing. What brand do I use? I LOVE Wholly Guacamole! And, I’m not getting paid to say that. FYI, this guacamole is perfectly worthy to sit atop of what I consider to be the best Mexican Seven Layer Bean Dip in the world. Add your favorite STORE BOUGHT salsa. Once again…NOT SORRY! For the seventh and final layer. It’s my Game Day Cheese Dip. Make a batch without the salsa and drizzle or pour, whichever you prefer, over the top. And, that’s it! Congratulations! 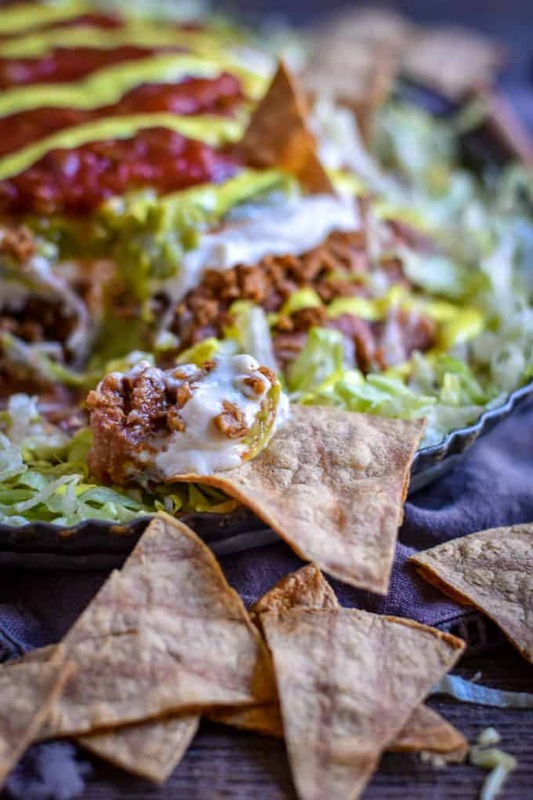 You just made Mexican Seven Layer Bean Dip. Keep this dip healthy by serving with my Homemade Tortilla Chips. But, don’t stop there. 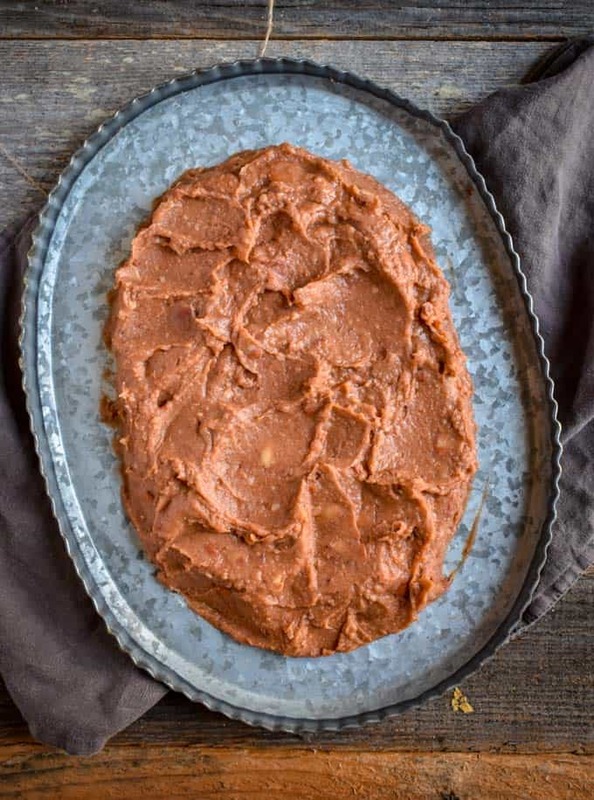 Turn this bean dip into an amazing taco platter. “How?” You ask. 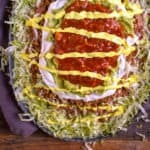 Make some of my Crunchy Baked Taco Shells and fill them with heaping spoonfuls of this Mexican Seven Layer Bean Dip. It’ll be one of the most memorable and delicious experiences of your life. Yeah, it’s that good. 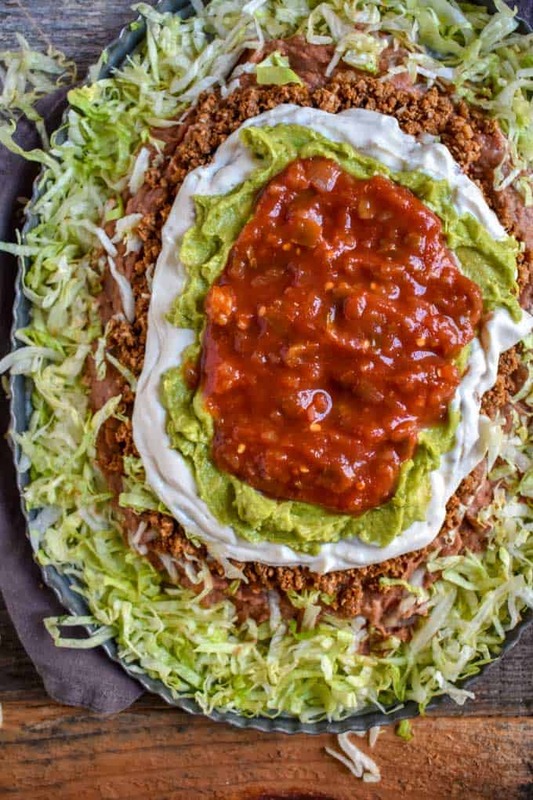 You don’t need a reason to make this dip. Yes, it’s great for parties and the big game. But, do it just because you love your family or show your friends how much they mean to you. And, don’t be surprised to see them go back for thirds or fourths. It’s completely normal. 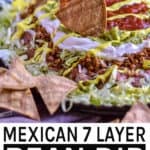 Mexican Seven Layer Bean Dip! Made with my Unfried Refried Beans, Cauliflower Mushroom Walnut Taco Meat, Easy Vegan Tofu Sour Cream & Game Day Cheese Dip! It's healthy, whole and totally vegan. Spread beans on platter or in 9x11 baking dish. If using a platter, remember to leave about 1 1/2" to 2 inches of space around the edge of the beans. On the platter, place the lettuce around the beans in the empty space. 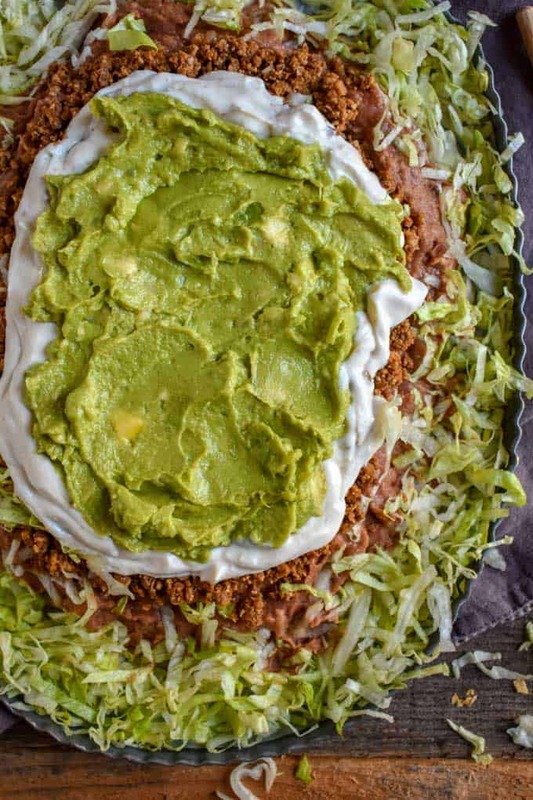 If you are using a baking dish, simply spread the lettuce on top of the beans. Next, spoon desired amount of Cauliflower Mushroom Walnut Taco Meat onto the beans and evenly spread. 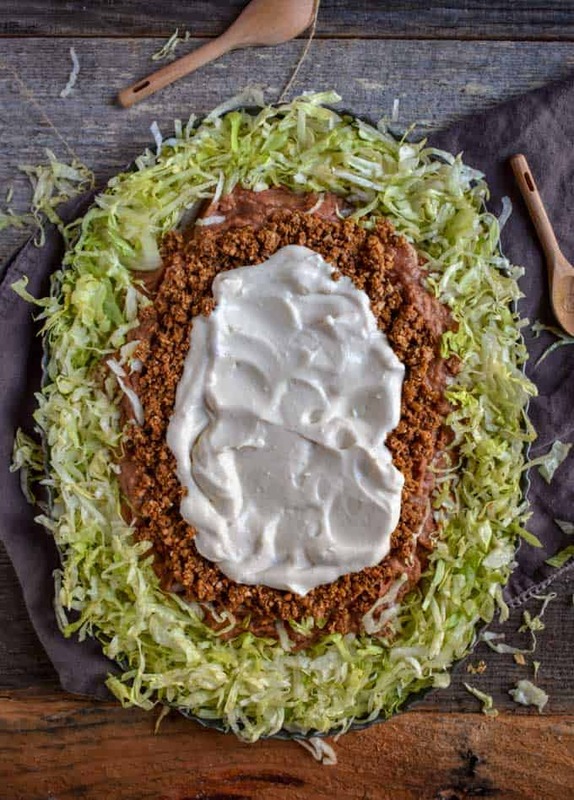 Add the Easy Vegan Tofu Sour Cream on top of the taco meat. Use whatever amount you wish, but I like to add just enough to cover the meat. 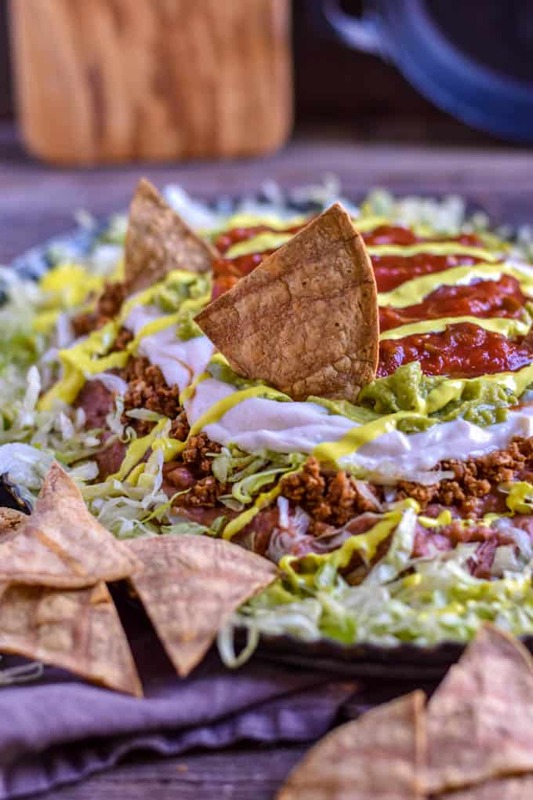 Spread guacamole over the sour cream. Cover guacamole with salsa and evenly spread. Finally, drizzle with Game Day Cheese Dip. Serve immediately or cover and store in fridge until ready to serve. Serve with Healthy Homemade Tortilla Chips. Or, make some of my Crunchy Baked Taco Shells and serve as tacos. Store leftovers in the fridge in a covered dish. Will keep 2-3 days. 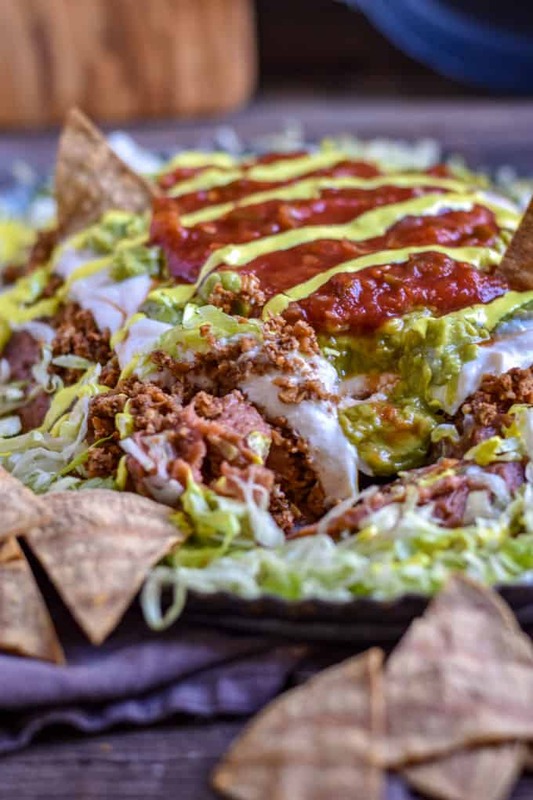 I can rate this 5 stars because I’ve made your taco “meat” recipe and turned it into nachos that were among the best I’ve ever had. So I can just imagine how freakin’ delicious this will be! I love being able to transform favorite Mexican food recipes into whole food/plant-based dishes with no oil. It makes me want to host parties just for omni friends to show them how delicious this way of eating really is. That this food is also healthy is a super big bonus. Thanks again for another great recipe, Shane!